So youâ€™re looking to Study Abroad.Â Good job, now muster the confidence to search for a program and commit.Â The earlier you do, the more time youâ€™ll have to save money.Â I can give you some general advice about choosing a program but letâ€™s face it, youâ€™ll probably forget all of it or be swept away by some cool marketing campaign.Â Thatâ€™s alright, hereâ€™s a little bit about the program I chose and why YOU should choose it to. The KIIS Study Abroad program is perhaps the cheapest and full-featured programs youâ€™ll come across.Â While their business class offerings are a bit scarce, there are definitely enough options to take care of your needs.Â Luckily, their most feature-rich and well-established program in Bregenz, Austria, can help you grab some international study classes. Letâ€™s start off with the first thought to cross your mind: who wants to go to Austria? Iâ€™m glad you asked.Â As someone who studied Spanish, Spain was my top location choice.Â That didnâ€™t work out.Â In fact, of the roughly thirty students in 2011 Bregenz program, nobody chose Austria first.Â Aside from the Hapsburgs, Austria isnâ€™t really known for much of anything (and contrary to popular belief, there are no kangaroos). 1.Â Â Itâ€™s the only KIIS program and one of the few overall programs to allow extensive travel. 2.Â Â Bregenz is close to Germany, Switzerland, Lichtenstein, France, and Italy. 3.Â Â The program has high upfront cost but is cheap once you get overseas.Â Many students spent less than $1000 USD. 4.Â Â Bregenz is westernized enough to feel comfortable but European enough challenge your habits. 5.Â Â Â Itâ€™s a like a resort/retirement town.Â Pretty people, pretty places, great shopping. 6.Â Â Beer is cheaper than water, and its good beer at that. 7.Â Â The sun shines from 4:30 AM – 10:00 PM.Â Who needs sleep anyway? The basic program setup is simple.Â Monday through Thursday, you go to class.Â Classes are two hours each and you can take 1-2 of them.Â I know youâ€™re going for the credits, but keep in mind youâ€™ll want plenty of time to enjoy yourself.Â Decide accordingly. Once classes are over Thursday by 3:30, youâ€™re free to travel.Â Bregenz is the only program with a Eurail Pass included: this pass gives you unlimited travel throughout five countries (usually Austria, France, Germany, Switzerland, and Italy). Â Want to go to Rome?Â Have at it.Â Eiffel Tower?Â Itâ€™s beautiful at night and â€œsparklesâ€ on the hour.Â Skiing on the Alps?Â Insurance is included.Â You have three days per week to get it all in, so plan early, keep up with homework, and have fun. Some other programs actually discourage travel while overseas.Â Ask a lot of questions and strongly consider Bregrenz.Â It doesnâ€™t sound as cool as Paris or Barcelona, but I guarantee you itâ€™s safer, cleaner, and a hell of a lot more fun. 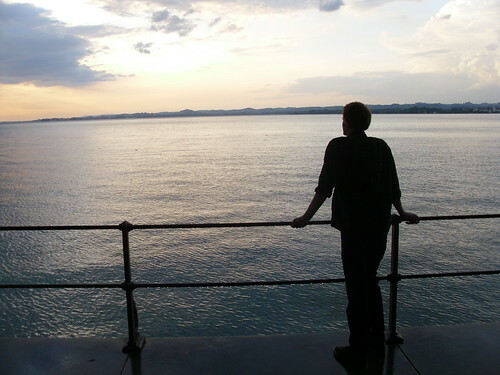 Only Bregenz allows you the opportunity to take cheesy photos overlooking the obscenely beautiful sunset at Lake Constance. Hola chicos! Itâ€™s been five weeks and sadly my time in Sevilla is coming to an end. For me, making the decision to study abroad was very difficult. I went back and forth numerous of times, but in the end, I MADE IT and to be honest, I probably would have regretted not coming. My favorite part of this trip would probably be going to different places. Throughout the five weeks I have been to Madrid, Toledo, Sevilla, Granada, Cordoba, Jerez, Cadiz, Portugal, Venice, Verona, and Milan. Out of those 11 locations, Portugal and Venice were my absolute favs! Portugalâ€™s beaches were so pretty, probably the prettiest beaches that I have ever been to. So, if you ever have the chance to visit Portugal, I would highly recommend you stopping at one of the beaches. But… VENICE or as the Italianâ€™s call it VENEZA. Venice was an interesting trip. I actually went with another chick from Louisville. I learned a lot about myself. To be a person who hates geography, I was quite amazing at finding my way through the city with a map. I highly recommend anyone who studies abroad to be very good at reading maps because basically every where you go youâ€™ll get a map and be by yourself, well ok maybe with some friends but from experience, everyone is not going to be willing to try and lead other people with a map, they are just going to want to follow someone. Now the hostels, :/ YIKES, they were so sketch but hey when youâ€™re studying abroad, the best thing to do is be smart and try to go the cheapest routes because I can almost guarantee that while youâ€™re abroad and using a different currency, youâ€™re going to check your money at some point and feel like youâ€™ve done lost about 100 euros. Iâ€™ve done it multiple times, along with many of the people that I hung out with. Another advice is to keep a record of what your daily expenses are! The hardest thing with studying abroad is probably adapting to their culture. For instance, I like to eat A LOT and here in Sevilla, it seems like food is not even on their priority list. In America we eat breakfast, than lunch at about 12 or 1 and dinner at about 6 or 7. Nope thatâ€™s not the way it happens in Spain. More like eat lunch at like 3 and dinner at like 9 or 10. My stomach growled constantly within the first few weeks, but now Iâ€™m pretty used to not eating until late. It will be interesting when I arrive back in the states and have to start eating earlier again, I think it will be very hard for me to do since Iâ€™m not hungry at 6 or 7. Sorry that I am all over the place with this blog, but to wrap it up I must say if you ever have the opportunity to study abroad in school then DO IT. Especially since it is much cheaper to do during school than it would be if you tried to go abroad later in your life. I had a great time over here and a trip that I will never forget. Iâ€™ve met many people from different places in the United States and hopefully we will stay in touch and I will be able to take vacations and go visit them. Overall, two thumbs up for Spain! 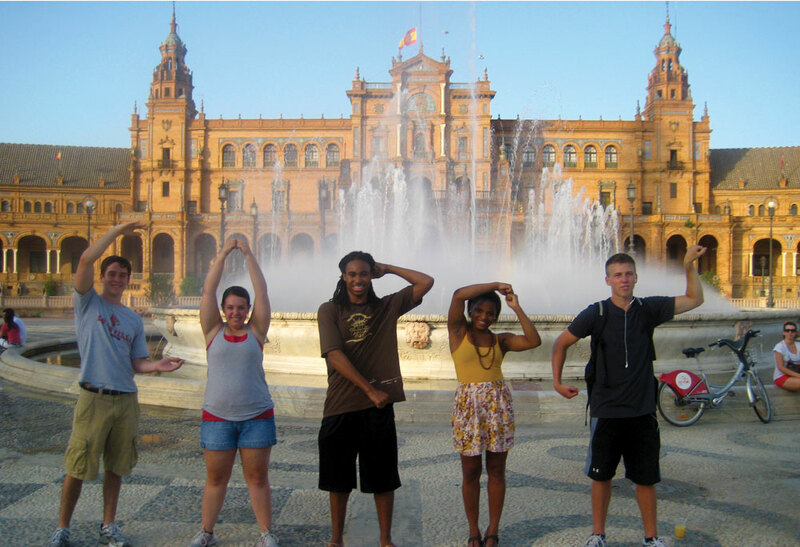 Studying abroad is a one of a kind opportunity. I can honestly say that I have never traveled to a place on my own before. It has been an amazing experience- definitely one that I will never forget. I am so grateful for all of the people who have helped this dream of studying in another country come true. Sometimes it is still hard to believe that I have been here for 5 weeks. Living in another country really pushes you to learn the culture. The culture here in Spain is very different from the United States. Not only do they speak another language, but they also have a different schedule, style, and overall way of life. The hardest thing to get used to here was the meal schedule. They usually only have coffee and fruit for breakfast around 8 a.m. (which of course I was never awake for). Then they donâ€™t eat lunch until 2 or 3 in the afternoon. It is the biggest meal of the day, so if you miss it, then youâ€™re out of luck. Dinner is served around 10 p.m. The people here go out every night and stay out until 4 or so in the morning. It is a crazy lifestyle, but a whole lot of fun. Sevilla is such an amazing city with so many things to see and do! I would recommend visiting here to anyone. I definitely want to come back some day. Classes here are similar to ones in the U.S. The professors are all really nice and both of my classes were taught in English so they aren’t hard to understand. The teachers know that you arenâ€™t only here for school, but to spend time experiencing the Spanish culture and traveling, so they are really nice about scheduling tests and stuff like that. Overall, I have truly enjoyed my experience here. I would suggest studying abroad to everyone! Here is some real world knowledge to help you if traveling to China. I’m typing on a mobile phone so forgive my short advice, which brings me to my first point. Bring a laptop, and don’t expect the same capabilities as home. Internet access in China is spotty at best and even a fast connection does not always guarantee any particular website will be available to you. Sometimes they work, sometimes they don’t, except Facebook, it never works. Learn Chinese food words, numbers, and common phrases in ordering food, riding in a taxi and bargaining with street vendors. These are some of the only times you are on your own and the language barrier can severely hinder a simple process. Never wait to buy a souvenir you really want. Always go into a bargaining situation ready to walk away at any time. A look of excitement and satisfaction will only solidify a sellers high price, act aloof and you can regularly buy items for less than half their asking price. The Chinese people as a whole are very polite and eager to please, some speak rudimentary English so with a little patience you can go a long way. Hope this helps an would-be travelers. More knowledge soon to come.